“Under our Constitution, it is for the body, the people’s representatives, to make new laws. For the executive to ensure those laws are faithfully enforced. And for neutral and independent judges to apply the law in the people’s disputes,” Judge Gorsuch, 49, told the Senate Judiciary Committee on Monday. It has been 13 months since Justice Antonin Scalia’s death, and Congressional Republicans refused for 10 months to act on Barack Obama’s nominee for Supreme Court, Merrick Garland. That refusal colored the beginning of the hearings for Supreme Court nominee. Judge Gorsuch is a widely respected yet strongly conservative member of the Denver-based 10th US Circuit of Appeals with a legal philosophy akin to Scalia’s, who has spent 10 years on the federal bench, according to AP. Thirty-nine percent of Americans said they had a positive first impression of Gorsuch. That's compared to 24 percent who expressed a negative view of the nominee, according to a CNN/Opinion Research Corporation (ORC) poll conducted in February a week after Trump announced him as his Supreme Court nominee. Republicans were most in favor of Gorsuch's appointment, with 84 percent saying the Senate should confirm him. Democrats were mostly opposed, with 61 percent saying he should not be confirmed. Even so, 51 percent of those surveyed said Senate Democrats – most of whom oppose Gorsuch's nomination – would be justified in using Senate procedures such as a filibuster to "prevent an up-or-down vote on the nominee." Forty-one percent said they would not be justified in doing so. Almost half (49 percent) said Gorsuch's ideological position is "about right," while 34 percent said they think he will be too conservative. The majority of Democrats (53 percent) said they believe he will be too conservative. The panel’s chairman, Republican Chuck Grassley (Iowa) said his panel will likely cast a vote on the Supreme Court nominee in two weeks, on April 3, with a first vote scheduled for March 27. Grassley was quick to accuse Democrats of already engaging in partisan politics. We're getting a preview of what Dems will ask about: Feinstein citing women's health, Second Amendment, campaign-finance law, & workers. 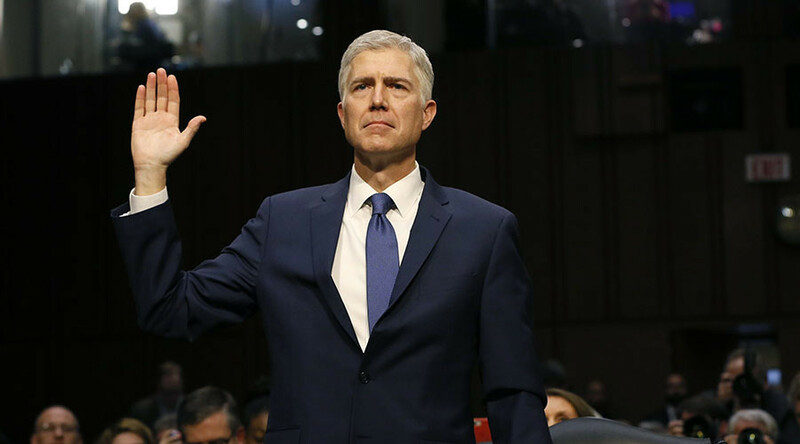 President Donald Trump nominated Gorsuch in February. During his campaign Trump talked about nominating a judge “who would overturn Roe vs. Wade,” the Supreme Court decision that respected a woman’s right to privacy under the Fourteenth Amendment and extended a woman’s right to have an abortion over states’ rights. Republicans sought to emphasize that Gorsuch was not President Trump. “I want to hear from you why Mr. Priebus would say that,” Durbin said to Gorsuch. Many of the senators used their opening remarks to emphasize judicial independence. Several of the more liberal Senate Democrats have already announced plans to oppose Gorsuch and seek to block his nomination from coming to a final vote. Gorsuch will need 60 out of 100 votes to advance his nomination. Republicans control the Senate 52-48.